I’ve got two old Mac Pros, and on one of them, the Nvidia 8800GT video card suddenly started causing weird errors in Windows. 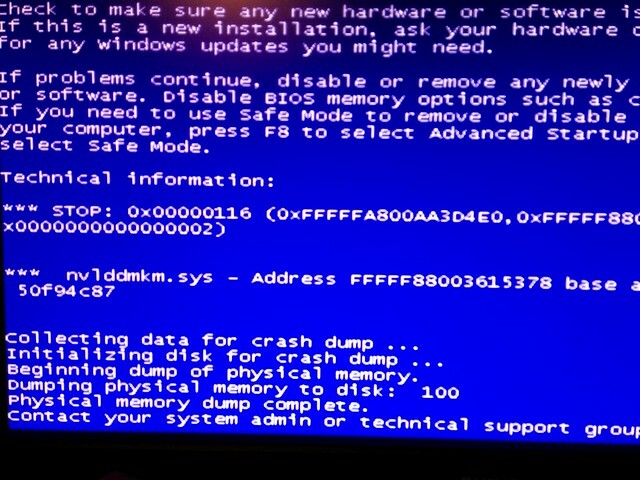 Then it started doing the blue screen of death repeatedly, a crash in nvlddmkm.sys. I have no idea why it started happening now — the Nvidia drivers don’t appear to have been updated for months, and Windows Update hasn’t installed anything for almost a week. Seems now to work, touch wood. Update 2013-11-19 18:45 — No such luck. It seemed fine this morning, but later on started crashing like before. Investigations continue. Update 2013-11-19 21:00 — After playing around disabling various things, and puzzling over what might have updated itself (since there was nothing recently installed or patched listed by Windows), I think I may have found the culprit: the Steam client beta (which I’m using to get the family sharing trial). Have disabled this, and Windows seems to be stable again. Will try it for a bit longer, then report findings to Steam. The card is an NVidia GeForce 8800 GT, quite a nicely specced card. I suspect it’ll need replacing, dammit. Update 28/11/2013: As per the comments I found another spare PCIe card (an ATI Radeon 3870) which works… in Windows. Not in OS X. Even the broken card partially works in Windows, but not at all in OS X. A workmate pointed me to the Tony Mac x86 web site, where I found a good list of graphics cards compatible with OS X.
Thankfully however this specific machine is mostly used for Windows-only, so there’s no tearing rush. In fact Windows performance index thingy rates the ATI card slightly higher than the nVidia one. One option is to buy the official Apple-supported Mac Pro video upgrade kit, an ATI Radeon HD5770, which is A$299. Despite the Apple site claiming it requires a post-2010 Mac Pro, plenty of sources indicate it’s fine with a 2008. This entry was posted in Mac, Windows on Tue 2013-11-19 by daniel. I’ll ask a stupid question: is the fan clean, and working? Certainly not a stupid question. The main fan and the fan on the card both seem to be working, and while there’s a little dust around, it’s not a lot. I have a spare ATI Radeon 3870 that a friend gave me… currently trying that instead to see if it works. It does seem to be okay in Windows. OS X might be a different matter. This is actually the second PC to go bung in this spot. I am wondering if perhaps there’s something dodgy with the power out of this outlet, and it should go through a different one, preferably with surge protection etc? It’s conceivable you have bad power; I had computers dropping out once a week and blowing power supplies – and other things – about once a year. Then I spent about $100 on a power conditioner, and everything’s been dandy since. Presumably you could use an isolated UPS the same way as a power conditioner. I’d stick with the premise that there’s something wrong with the video card; that doesn’t mean bad power didn’t kill the card. The spare one I had works fine with Windows, but I’m not sure how to get OS X to recognise it. (Score another point for Windows.) Thankfully this particular Mac Pro is being used only for Windows, so it doesn’t matter too much. The previous machine to die was, it looks like, the victim of a dead motherboard. Exactly the same issue as you (bar the Mac related part). 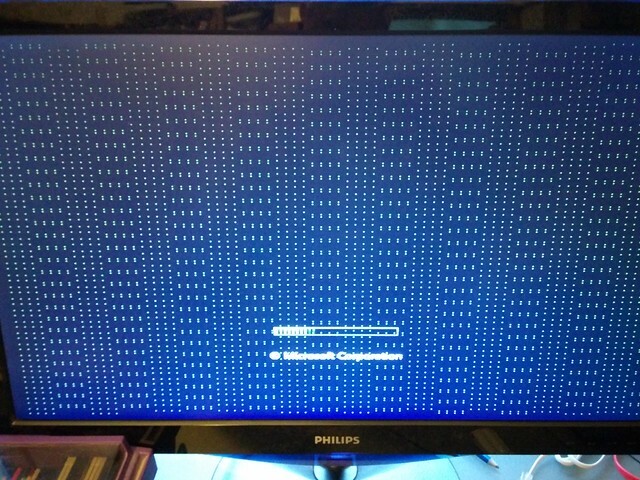 nvlddmkm.sys BSODs in Windows startup, but boots on a VGA driver just fine. Did you test your card in another Windows system at all? Were you able to find out the reason why it died at all? @James, I have another Mac Pro – from memory I did swap the cards over, and it does appear to be the card. For now, because one of the Mac Pros is only used in Windows, I’m using the 3870. I’m thinking I might contact Apple Support to find out if the original card can be replaced. Alternatively, eBay has various other cards, including PC cards which have had the OSX firmware added to them… or try the link in the post to compatible cards… some are pretty cheap, and Googling around seems to indicate people have had success with them in a Mac Pro. I actually tested my card on a friends PC last night, and reproduced the issue to a T.
I then tested his card in mine, and it worked a charm. Confirmed the card was fried. Shopping around now. I don’t need to worry about getting an Apple compatible card, so I have a little more freedom it seems!